It’s by no means a necessity to work with a full-service operation, but the advantages can be numerous. Starting with the planning phase. Having a single company who understands how all the pieces fit together will allow them to coordinate your overall strategy, negate duplicate effort, avoid finger pointing, and will just make it easier for you to manage. 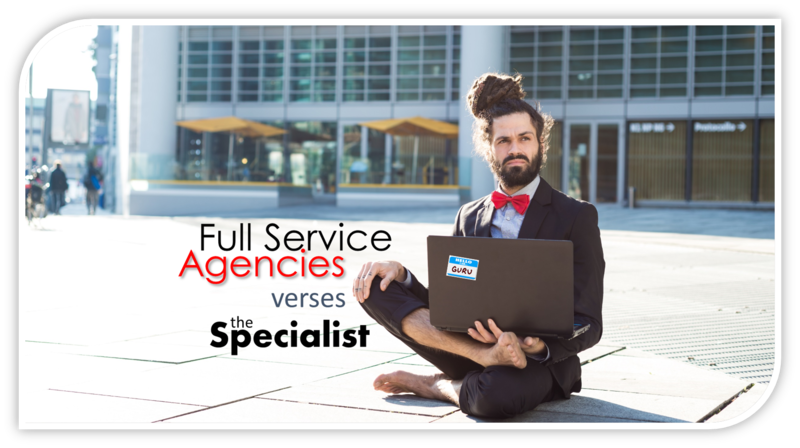 Specialists certainly have their place when the general consensus is to attack a particular marketing initiative to the exclusion of other options. A specialist may be able to bring a tested strategy and uncommon knowledge to the table. Just make sure they have a track record of playing nice with others. Pro Tip: Stay away from any self-proclaimed “experts” with “Guru” in their title. Full service can mean a multitude of things. It could mean that they offer a comprehensive suite of services on an itemized basis. Or it could mean that they offer their entire line of services on a retainer basis. Either can work with a well-defined strategy designed to pull together the right combination of services. Just keep in mind that if you go with the itemized version, more than likely you will be itemized to death with “extras” that aren’t explicitly outlined in your agreement. Years ago people spent a lot of time on a few media outlets (TV, Radio, Yellow-pages, Newspapers & Magazines). Now consumers spend short amounts of time on a lot of media (hundreds of different websites and scores of different social platforms). The consumer experience is now so integrated and co-dependent on cross-platform exposure that we typically recommend (and offer) full-service programs that cover the vast majority of places consumers spend their time. At the end of the day it comes down to confidence and competence. Are you confident that your specialist or full-service agency is competent enough to become that trusted advisor and deliver the goods? Big decision right? Not only is your budget on the line, but so is time. It does take time to get results, but you would hate to find out that after months of optimistic excitement, you are no farther along than when you started. Just more frustration with less cash. Pro Tip: Do your homework! Ask the right questions…and know what a good answer is BEFORE hiring an agency or specialists. I’m recommending the free eBook below. It’s written by digital marketers, about digital marketers, so there is uncommon insight to help you align yourself with the right digital marketing partner. For the full eBook of questions to ask BEFORE hiring a Digital Marketing or Web Development firm, you can download that here for free. Below is an expanded section from our free eBook “the digital marketing smell test…how to hire an agency that doesn’t stink”. You’re welcome to download your own copy here (comes with a handy check list of interview questions and acceptable answers). Who will own your assets? If you pay for it, it’s yours…right? It’s your website, it’s your social media, and it’s your created assets. If your digital marketing firm demands ownership, run fast and run far. When you meet your contractual obligations you should own all the work product that is ownable. If it’s not “ownable” in the classic sense (like social media and Google Analytics), then you should have access to your digital assets should you ever part ways. Don’t assume that everything your digital marketing company does for you belongs to you. I’ve seen amateurs and unscrupulous professionals inadvertently, or strategically lock their clients into their services by registering everything under THEIR name or tying you into proprietary situations that are not easy to untangle. Domain Name: Once upon a time we took over the website and marketing for a new client. When we went to point the domain name to the new site we built, we discovered the client didn’t own his own domain name (although he had paid for it). The previous (and yes bitter) former provider wanted $1500 to reassign the domain ownership citing all the work involved (about 5-minutes). No he didn’t get away with it. More common is when the person who initially registered the domain name just vanishes. This goes for ex-employees as well as third parties. It’s just best practice to register a company asset like your domain name under the ownership of your company. Social Media: Technically social media properties are not really “ownable”. It’s more about access. We typically set up the social media assets for our clients, but we make sure that they are claimed in their name and that they have full administrative rights. I’ve seen an Ex-employee who started a competing business hijack his former employer’s social media accounts and direct the traffic to his own business. How did this happen? The employer just assumed the employee would do the right thing and didn’t put much thought into the ramifications down the road. Bottom line? Doesn’t matter who sets up your social profiles as long as you have the administrative control. Code & Proprietary Platforms: Sometimes it’s necessary to develop custom applications and functionality that is unique to your business. Unlike various commercially available plug-ins and modules, you need to ensure that any custom code that is developed on your behalf is transferable to you should you part ways with your provider. Copy, Images & Graphics: As far as your customers are concerned, these are the things that make up your web presence. These are the things they actually see and interact with on your website and social platforms. You don’t want to find out after the fact that your provider will pull these elements as a special parting gift, claiming they own all work product. And by the way, if your agency is providing imagery such as stock or custom photos, make sure the images are licensed properly and that license extends to you. If not you can get a nasty-o-gram attached with a bill that far exceeds the actual value of the image. The actual Website: This one may be a little obvious, but don’t assume that you own the website. If it’s a website that can be hosted anywhere, make sure you have the rights to the files through FTP (File Transfer Protocol) should you part ways with your marketing firm. If the website is built on a SAS (Software As a System) platform, just make sure that you can have the hosting transferred to you. Keep in mind that taking ownership of the website may be contingent on you meeting your contractual obligations.